Combine the paprika, cumin, cinnamon and chilli powder in a small bowl. Then toss the salmon fillets in the spice mix and oil to ensure it is all covered. Cover and allow to sit in the fridge to marinate for 20 mins. Meanwhile to make the salsa, brush the corn with oil and then grill it on a high heat in a griddle pan or on the BBQ. Turn the corn occasionally to ensure all sides cook evenly, this should take about 7 mins. Once the corn is cool, cut the kernels away from the cob and combine in a bowl with halved cherry tomatoes, finely chopped red onion and coriander. Season with salt and pepper. Heat a non-stick saucepan, and then place the salmon skin down in the pan. Cook for 3-4 mins, or until the salmon begins to cook half way up the sides. Then reduce the heat and flip the salmon and cook for a further 2mins. Allow resting for 2 mins, while you serve the salad. 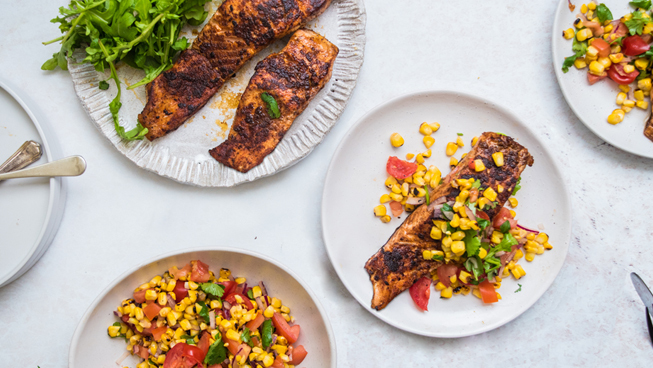 Place 50g of rocket on each plate, top with a piece of salmon and corn salsa and enjoy!